A while back I talked about the famous early 80s tan repaints of Grunt and Clutch. Here’s another continuation of the venerable desert repaint theme, along with a bit of new sculpt era Frankensteining. Duke was a member of one of three Walmart exclusive Valor Vs. Venom two packs. Each pack had an urban camo Cobra and a desert tan Joe. Duke was the only figure of the set to feature parts switching. He’s wearing Snake Eyes’ outfit! This is more than a little of an odd look for the team’s top sergeant, as the Snake Eyes uniform doesn’t translate all too well when given to other characters. I just can’t picture Duke going for the skin tight look. I think he later adopted a slinky black number in the Devil’s Due comics, but I still found it weird. On a positive note, a simple head swap can create a new sculpt styled desert Snake Eyes. These repaint figures showed up and were quite the surprise. I remember the figures not scanning or being listed in the computer when I bought them. My local store ran through them fairly quickly, an odd occurrence during the early to mid 2000s. There didn’t seem to be much competition for the toys when it came to other collectors. Many folks weren’t drawn back into Joe until the 25th Anniversary series. As such, most of the figures were easy pickings, even when the first shipments showed up. The accessories were also a bit of strangeness, with Duke being armed only with a Sound Attack version of his 1992 rifle. I get the link to an old figure, but the Sound Attack gimmick is a mystery for a Valor vs. Venom figure. The missile launcher that came with all three desert Joes is another question mark. With no mount, and no way for the figure to hold it, I’ve never understood this strange weapon. It almost looks like it was attached to part of a vehicle, but I haven’t ever checked to see what its origin is. Maybe someone out there knows. The Cobra troop builders in the packs were pretty great in the deco department, especially the Iron Grenadier. The back of the package depicts Duke with a desert camo on his uniform. It’s unfortunate that the Joes didn’t get the same detailed paint apps as the Cobras. I think a nice pattern of more contrast would have made this figure a little more interesting beyond its status as a Duke/Snakes hybrid. I started picking up selected new sculpt figures after the o-ring returned and I had begun reading the Devil’s Due comics. It wasn’t until the vintage style three-packs showed up that I fully dove back in, though. Somebody posted a team of desert-themed Joes online not long ago. 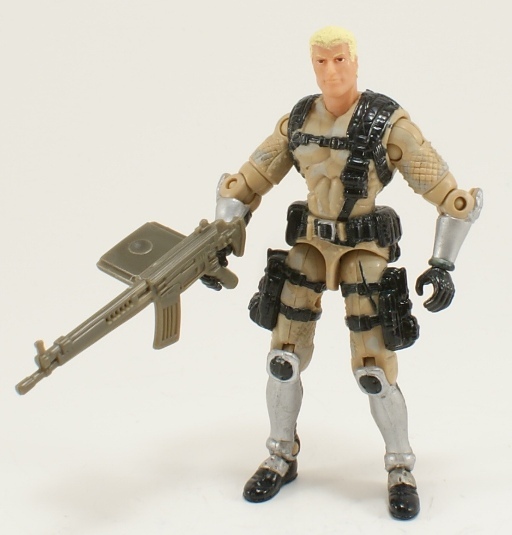 It featured Tan Grunt, Tan Clutch, Brazil Mission Leatherneck, I think one or both Dusty figures, and a custom or two. This Duke might have fit in there had he been done vintage style. Using Snake-Eyes’ duds is kinda nutty, but this was a weird time for Joe collectors in general, if you think about it. I will definitely perform the head-swap mentioned with this figure. As for the missile launcher, has anyone tried attaching it to the Patriot Grizzly or something? Yeah, I remember how easy it was to find Joe stuff back during the new sculpt era. It makes me look back on those figures even more fondly since the only stuff I ever had trouble finding was the last wave of Valor Vs. Venom. That said, I passed on these sets. While I liked the urban camo Cobras, I didn’t like them enough to buy Joes I already had in a desert camo. That’s not my favorite look and as I recall, the other two Joes in the repaint series weren’t much to write home about to begin with. 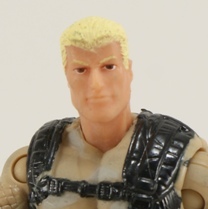 Occasionally, in the comics, Snake Eyes would wear a blonde mask over his face when out it public. You could just pretend this is Snake Eyes and he chose to wear his civilian mask with his combat outfit. That’s a great idea. The skin and hair looks rubbery enough. The face has a neutral stance which suits the purpose nicely. Not all Walmarts seem to get the same stuff, I have wondered if it is a regional thing? These types of figures never made it here. I stayed away from new sculpt because of the way the figures were proportioned. They just looked dumb. The vehicles I’m going back and collecting because there were some good ones in the mix, but the figures did not impress. Seemed like the head didn’t fit too well in that body, IIRC. This mold struck me with what was often wrong with figures from that time. They gave the figure swivel wrists but it still can’t hold a sword with two hands very well, because the upper arms and chest are too bulky. Still better than that t-crotch Gung-Ho that was part of the wave. For some reason the card game featured this Duke costume.